Purging via self induced vomiting (throwing up after after eating) is not only dangerous to your health and wellbeing, but it is also highly ineffective at controlling your weight. The problem is once you develop the habit, it can be very challenging to stop. It’s not nice, it’s not pretty and it’s not something many of us want to talk about but for a large percentage of the population purging food (making yourself sick) is a very real problem. If you purge your food, you’re probably only too familiar with the urges, the shame, the secrecy and the dangers of self-induced vomiting. I’m also sure that you’re aware of the fact that making yourself sick is neither effective nor healthy and can actually wreak havoc on your body, causing long-term health complications and even death. Nevertheless, getting rid of the habit is still difficult. I know I struggled to make sense of it all at the start of my recovery. Purging describes any behaviour that attempts to rid the body of calories after eating, the most common being self-induced vomiting. Other forms of purging include abusing laxatives, over-exercising, taking diet pills, misusing diuretics and fasting for extended periods of time. Some people use only one means of getting rid of food while others use a combination of methods. Since you’ve found yourself here, you might have already made your decision to stop – but where do you start? How do you actually stop? How do you begin cleaning up the mess that your bingeing and purging have left in their wake? This guide is meant to help my fellow sufferers find their way and stick to it. Think of it as some useful tips to help you stop purging. I do hope, and strongly believe, that taking these steps, one by one, will aid you in your recovery. Now take a deep breath and step forward – towards a happier, healthier you. Before we begin I want to touch on something very important, if you have been purging via self induced vomiting and/or taking laxative/diuretics, it’s very important that you visit your doctor to make sure that your health has not been jeopardised. Purging is dangerous and it can have serious health consequences. Some conditions associated with vomiting, such as tears in the oesophagus, can be very serious or even fatal. If you see blood in your vomit, see your doctor immediately. Don’t be embarrassed to see your doctor. They are presented with all kinds of conditions every day, are sure not to judge you and can refer you to specialist services. Also, please note the advice in this article is for informational purposes only and should never be taken over the advice of a trained medical professional. True recovery always begins with forgiving yourself. You must understand that this is not your fault. Because studies show that diets cause bingeing. In fact, one large study found that frequent dieters were TWELVE TIMES more likely to report episodes of binge eating. If you have ever restricted your food in the past this can lead to MASSIVE urges to binge on food. Over time these urges to binge become stronger and stronger. The more you restrict your food intake the stronger they become. Eventually your willpower to resist wanes (eventually it always does) and you give into the cravings and binge on food. This can lead to feelings of disgust, shame and anxiety. You may feel like you did something terribly wrong. You feel like a failure. You worry that the food is going to turn into fat. You feel like you have to do SOMETHING, anything, to make the feelings of shame and intense guilt subside. This anxiety, worry and guilt is what causes us to turn to self-induced vomiting, laxative abuse, diet pills or excessive exercising. People make themselves throw up after eating due to the mistaken belief that it helps to avoid potential weight gain (in the long run it doesn’t). Also to help release uncomfortable, negative feelings (in the long run this doesn’t work either). The problem is, once you start to make yourself sick, it can quickly turns into a habit. It may start as a one-off occurrence – you overeat and find yourself desperate to relieve the pressure inside your stomach. You think: “I’ll just do this once”. Then the next time you overeat, the option is already there and you decide to take it. Just this one time. Just today, and then never again. In my case, as in so many others, that ‘one time’ turned into years of physical and psychological torture. Right now, it’s time to stop blaming yourself. So take a moment to realize, it is not your fault that you are in this situation. The reason you are purging now is because in the past you went on a strict diet. The diet lead to a binge which lead to a purge. If you never dieted, you would never have binged and you would not have purged. If you are looking to blame someone, blame our societies obsession with dangerous restrictive diets (that don’t work!). You are not weak, sick or broken. You have simply become trapped in an uncomfortable situation due to the misguided belief that restrictive diets are helpful. So, take a moment now to forgive yourself. You will feel lighter, relieved and more motivated to pursue recovery. By getting rid of the guilt, you’ll have freed up some much-needed mental space – which you can then fill up with energy, strength and resolve to break free from purging. 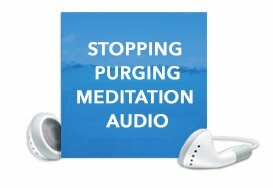 We’ve created a free meditation audio that will help to reduce any urges to purge. The audio will help to reprogram your sub-conscious mind, embedding some powerful suggestions that will make the whole experience of stopping purging a lot easier. Click on the link below to get your free audio. If you’re trying to stop purging, your biggest concern is very likely to be potential weight gain. You CAN stop vomiting without gaining weight. Ask yourself – does vomiting food really help you lose weight? The truth is that, ultimately, it doesn’t. On the contrary, it can lead to weight gain in the long run. The theory that throwing up helps you undo the bingeing is just another myth that we desperately need to raise awareness of. When you first start vomiting after eating, you might experience some initial weight loss – however, this is usually due to dehydration and is thus impossible to sustain. Since water is a large part of your natural body weight, some water loss is sure to show up on the scale. This ‘weight loss’ is only temporary, since your body will return to its normal state as soon as you rehydrate. A. After purging your body still absorbs the majority of the calories. Your body is very efficient at absorbing calories. As soon as you eat something, your body begins to absorb calories before the food reaches your stomach – it takes place in the mouth and the oesophagus. No amount of purging can stop this from happening. Also purging isn’t very effective at getting rid of all the calories eaten. In order to put this hypothesis to the test, the Pittsburgh Human Feeding Laboratory conducted an experiment. It included 17 individuals, all of whom were diagnosed with bulimia and whose weight fell into the ‘healthy’ category. After an overnight fast, the participants were instructed to pick items out of a vending machine and “binge in the laboratory as they would binge at home”. There were no restrictions on time or the amount of calories they could eat. They were given a plastic bucket to purge into. The study concluded that, while the average binge consisted of 2131 calories, the subjects of the study only managed to purge an average of 979 calories by vomiting. Over 50% of the calories remained. To be fair, this is a small study and a lot of important factors haven’t been taken into account. Nevertheless, it still clearly shows that our bodies retain the majority of the calories that we’ve consumed even if we purge the food afterwards. If you purge your food, your body registers the act as calorie restriction. It responds to deprivation by trying its best to fight against it – consequently, your metabolism slows down and your body quickly converts the calories that you do absorb into fat stores. By slowing down your metabolism your body becomes more efficient at holding on to fat. The very thing you were hoping to avoid. People rarely binge on salads. Instead, they crave muffins, pies, sweets, fizzy drinks or donuts – namely, refined carbohydrates. The problem with this is that refined carbohydrates are very appealing sources of energy. They are easily broken down into simple sugars and quickly absorbed into the bloodstream, causing a sudden rise in our blood sugar levels. As high levels of sugar are toxic to the cells, the body immediately reacts to the change by releasing a surge of insulin, which pulls the sugar from the blood. When you purge by throwing up, your body produces excess insulin, which causes your blood sugar levels to suddenly plummet to sub-normal levels. This leaves you feeling shaky, anxious, dizzy and most importantly craving fatty, sugary foods. A study published in the International Journal of Eating Disorders found that low blood sugar levels were directly tied to increased desire to binge on carbohydrates (Volume 9, 1990). Have you noticed that the more you purge, the stronger the need to binge becomes? Purging your food makes you crave carbs and sugar, which leads to more binge eating on refined carbohydrates, which leads to more purging. Throwing up causes those binge urges to skyrocket, meaning that by purging you’re likely to consume more food than if you just ate normal portions throughout the day and refused to purge them. D. It changes the way you think about eating. As you start purging more frequently, the way you view food usually undergoes a drastic change. You begin thinking that you can engage in binge eating without any immediate consequences. This is likely to encourage you to eat even more, as the eventual purge seems to undo the damage. It may seem like you’ve found the perfect solution – now you can have your cake and eat it too! This explains why most people who binge and purge generally weigh no less than they would if they didn’t engage in disordered behaviours. They give themselves permission to eat whatever they want in quantities that become ever bigger due to increased appetite and maddening sugar cravings. Rather than resulting in weight loss, purging leads to growing obsession with food, rapidly declining health, and destructive mental and physical impulses. All forms of purging are highly ineffective for weight loss. Vomiting after eating does not help you to lose weight. This makes it easier for us to finally let go of purging once and for all. It is not my wish to add more anxiety on top of what I am sure you already feel. Nevertheless, it’s important to talk about those dangers of purging. You don’t have to dwell on them for hours at a time, but ignoring them will do you no good either. You must acknowledge your enemy if you want to fight against it and win. So, let’s briefly touch on some of the dangers associated with vomiting after eating food. According to the National Alliance on Mental Illness, your heart is not built to withstand laxative use or daily vomiting. This type of stress may cause arrhythmia, heart palpitations, heart attacks or ultimately death. Purging can and does kill. Russell’s sign (visible scars and calluses on hands and knuckles). I know that this is a lot to take in. I know that it’s scary. Nevertheless, it is important to know the dangers. This knowledge can be used to help further your resolve to give up purging for good. The risks are simply not worth it. Get ready to stop self-induced vomiting. Now that you’re familiar with the effects and potential dangers of purging, it’s time to take action and start fighting back. So, let’s take a moment to get prepared. Choose an exact date and time in the not-too-distant future – perhaps within the next couple of days or so. This is the day when you’re going to stop purging. Your chosen date should be as free of potential stressors as possible. You must also decide what you’re going to eat beforehand. To begin with, stick to foods that feel safe. Keeping a few slices of cake down might be too big of a challenge at first. It’s best to start with foods that your know to be safe and less triggering. Let your body get used to the feeling of being nourished again. Even more importantly, allow your mind to make peace with the fact that you do NOT need to purge food. The key here is to take little steps forward and leave more challenging tasks for later. When your chosen date has arrived and you feel ready to give this a try, do your best to let go of the option of purging. No matter what happens, you will no longer make yourself sick. Draw a line in the sand and refuse to cross it. “You and I both know that you don’t really want to purge. You’re tired of the pain, the obsessive thoughts and the feeling of being trapped. You are strong, even if you don’t feel like you are. You are capable of saying ‘STOP’ and sticking to it. The chances are that you only continue purging simply because you can see no way out of the habit. No matter how hard it gets, no matter how strong the urges are, no matter how much effort you have to put into resisting their constant pull, YOU WILL NOT PURGE. I can assure you that, as more and more purge-free days go by and the option slips further away from your mind, you will find yourself becoming a much more peaceful, confident and a carefree person. The very act of not purging is easy. You simply refuse to do it and stick to your decision. However, this is not where the problem lies. The real problem is the fear and anxiety that can be induced by letting go of a familiar coping mechanism. You might feel like your mind is going at a thousand miles per hour. These thoughts are bound to come. They are to be expected. You’re facing your biggest fears. You’re only human – of course you’ll get anxious! The initial anxiety is, in fact, an important part of the recovery process. It’s scary to be scared – but it also means that you’re on the right path and there’s happiness waiting for you at the end of it. Remember that there’s no real need to panic. These thoughts have no basis in reality. They are fears, not facts. Your body is very much capable of handling the food. The food in your stomach is not fat. It will not make you gain weight. Accept and expect that you will feel scared, anxious and uncomfortable. You don’t have to like these feelings. All you have to do is accept that they’re there and you can’t do much about it. They will pass by themselves. You’re stepping outside of your comfort zone. The experience is never pleasant at first, but the gifts that it brings later on are absolutely invaluable. You can’t control your emotions, but you can control how you react to them. No matter how uncomfortable you get, the decision to stop purging is still yours. Having gone through it, I can confidently say that it’s the best decision that you could ever make. A much improved sense of wellbeing, vitality and health. A dramatic reduction in your binge urges. A huge surge in metabolism and energy levels. An improved sense of self-worth. Improved digestive tract and ability to absorb nutrients from foods. An ability to think clearer with better focus and concentration. You avoid all the dangers associated with purging (teeth loss, bodily harm etc). Generally little to no weight gain (some even report weight loss). You may feel distressed and uncomfortable when your stomach is ‘full’. You may feel compelled to purge to remove the discomfort. However, it’s normal for your stomach to feel slightly different for a short while after you’ve eaten, as the food takes some time to travel through your stomach and into the intestines. It’s possible to get used to the sensation and even start finding it quite pleasant. Your stomach is, after all, full for a reason – the food that you’re digesting is meant to keep you alive, healthy and mentally stable. What really helped me stop purging was replacing the habit with something else. I had to find a new activity to engage in after eating. I call this my “safe go-to”. What is a “safe go-to”? It’s something different. It’s something you don’t normally do. It’s something that has no negative associations attached to it. It’s a positive ritual which is meant to take the place of your purging. Go for a walk – get out of the house and fill your lungs with fresh air. Staying active helps to keep your digestive system running and wards off pangs of sadness or depression. Phone someone – even a short chat with a loved one can do wonders for your anxiety. Let them know that you’re struggling. Ask them to try and talk you out of purging if you’re having a particularly bad day. Most importantly, admit that you need help and be ready to receive it. Do some yoga – yoga is a wonderful tool for managing stress and getting rid of intrusive thoughts. You don’t even have to be particularly good at it – just look up some simple asanas online and do your best to replicate them at home. Listen to your body and let it guide you through the process. Relax and meditate – wrap yourself up in a blanket, close your eyes and listen to a relaxing meditation audio on YouTube. Allow yourself to forget your frustrations for a while. Stay in a seated position, stay present and let waves of relaxation wash over your body. Whichever activity you choose – and it can be anything that works for you, even if it’s not amongst my suggestions, – avoid visiting the bathroom for at least 30 minutes after a meal. At the early stages of your recovery, even the sight of a toilet can act as a powerful purge trigger. Stick to your new routine until it becomes a habit – this usually takes around 30 days. Once you get used to it, you’ll begin to associate the end of a meal with your safe activity rather than the act of purging. You may not be able to follow the exact same routine every time you eat – that’s completely understandable. Just try and stick to it when you can. It’s very likely to have a huge impact on the success of your recovery. If you find yourself struggling to avoid purging despite making use of your “safe go-to”, just try and delay it for the next 10 minutes. Research suggests that even a 10-minute wait can drastically reduce the brain’s response to a craving. By delaying the act of purging for as little as 10 minutes, you’re giving yourself an opportunity to ride the urge out. If your stomach feels uncomfortably full, try to embrace and accept it. Remind yourself that there’s nothing to fear. Food in your stomach won’t turn to fat. Food in your stomach will heal you and reduce your binge urges. 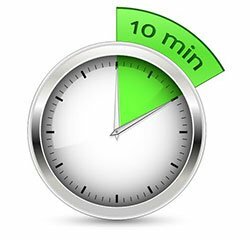 If the 10 minutes are up and the urge to purge is still there, don’t give up. See if you can go another 10 minutes. You might even need to repeat it the third time. However long it takes, try and stay with it. I’ve found that, as time goes by, these increments become shorter and might even disappear completely. All you have to do is be patient with yourself. It takes time for old wounds to heal. If you’re trying to stop purging, it’s extremely important to understand that just about everybody experiences some bloating at the initial stages of their recovery. A temporary increase in weight. First of all, you must remember that your body is NOT ruined and it CAN bounce back from the damage. I spent years not letting my body digest its food properly and, when I decided to recover, I was convinced that it must have forgotten how to work on its own. That is not true. Our bodies are equipped with infinite wisdom and perseverance. We’ve helped thousands of people over the years and we are yet to encounter a body that wasn’t up to the challenge. Sure, the bloating is not pleasant – but it is also absolutely normal. Your body just needs time to adjust to its changed circumstances. If you’ve been purging for a considerable amount of time, the chances are that your basal metabolic rate has temporarily lowered and the digestive process has slowed down. The food might take longer to pass through your digestive tract at first, adding to the initial bloating. When you purge for a prolonged period of time, be it by vomiting, abusing laxatives or using any other compensatory method, your body can become chronically dehydrated – which means that you have low levels of both salt and water in your bloodstream. In a state of dehydration your brain basically thinks: “I’m dying of dehydration in the desert. In case I don’t come upon an oasis anytime soon, I must prevent this body from urinating away the last of its life-saving resources.” That is exactly what it does. It instructs your adrenal glands to overproduce aldosterone, a hormone that prevents your body from getting rid of the necessary salt and water by urinating. Any salt or fluids that you ingest after first stopping purging will most likely stay in your body. That’s a good thing at first. Your body always has your best interest in mind. You’re so dehydrated that your blood and tissues need the extra salt and water. It’s life-saving. How long does the bloating last? For mild bloating your body will catch up sooner than you think. Once you stop purging, you should expect the bloating to last anywhere from 2 to 6 weeks – although a small number of people may suffer from it for a little while longer. Most people they will only experience mild bloating with recovery. While it may feel a little unpleasant, you have to remember it is not dangerous and that the bloating will pass with time. However, if you experience intense, prolonged bloating or it’s very uncomfortable, or if you are concerned about bloating in any way please consult with a your doctor. What should you do about bloating? There is tons of advice out there on how to reduce bloating. More often than not, the advice involves imposing new strict food rules or implementing diets that eliminate whole food groups. Not only is this not recovery-friendly, it also does not work. Your body is bloated because it’s trying to heal from the effects of bingeing and purging. You must be patient and give it all the time that it needs to achieve this. As strange as it might sound when you are dealing with water retention, the best way to cure it is drinking water. Make sure to drink at least 2-3 litres of water a day. Sip it at work, take a bottle with you wherever you go, drink soothing herbal teas and incorporate lots of fresh fruits and vegetables into your meal plan, as they are naturally hydrating. Whatever you do, don’t overdo it. The process of rehydration has to be gentle. This isn’t the time to guzzle water. Listen to your body at all times, limit yourself to a couple of litres of fluids a day and incorporate moderate amounts of sodium in your diet. If you purge regularly, your body might be lacking 5-15 pounds of fluids at any given time, so it’s only natural to observe changes in your body as it rehydrates. Your weight might shoot up quite suddenly and you might experience slight edema. Remember that this is not fat – it’s simply excess water. Seeing big changes on the scale early on in your recovery might derail your efforts. Try and make a pact with yourself. Avoid stepping on the scale for the time being. Better yet, move it out of your bathroom or throw out the batteries. If giving up the scale completely feels intimidating, challenge yourself to go without checking the number one week at a time. Use this simple technique for healthy stress relief. Many people describe purging as an effective form of stress relief – but is it really so? Once you get rid of your purging habit, you’re more than likely to realise that a life without purging is actually a lot LESS stressful. You no longer obsess about calories. You no longer have to go through the pain of making yourself throw up. You no longer feel ashamed of the habit, or have to hide it from your loved ones. You can stop worrying about the potential health implications. You notice a dramatic improvement in your overall well-being. Even if you do nothing else, you are guaranteed to live a much more carefree life simply because you’ve eliminated your purging problem. However, for some of us that is not enough. Purging, as well as bingeing, often develops as a response to overwhelming stress and you might need to find some additional healthy ways of dealing with it in order to prevent any future relapses. Now I am going to give you a really powerful and simple technique to reduce stress. This can be a lifeline for you in those moments when you feel really stressed out. Don’t just read this and ignore it. Please, please give it a try when you are feeling stressed. You will notice its effects kick in instantly. 1. Take a very deep breath and hold it in. 2. While you’re doing that, tense every muscle in your body for 5 seconds. Contract your toes, thighs, calves, buttocks, stomach, chest, arms and hands. Just squeeze, squeeze, squeeze as tight as you can. 3. Release every muscle as you slowly exhale. 4. Rest for 10 seconds and then repeat the exercise 3-5 times. This should take you less than 2 minutes. Try it now and notice it’s powerful effects. This simple method can do wonders for your nervous system. Give it a try right now and see the effects for yourself. You’re likely to experience an instant wave of relaxation. 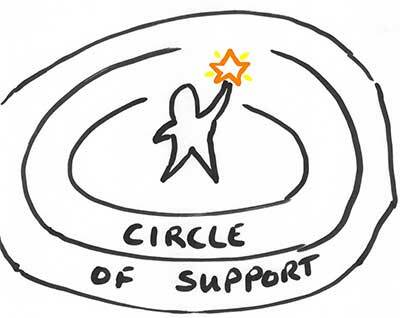 Having a reliable support network can make your recovery a whole lot easier. You don’t need a crowd of well-wishers. The strength of the network does not lie in numbers. Find a couple of trustworthy people and let them help you achieve your goals. Asking for help is too often seen as a sign of weakness – that couldn’t be farther from the truth. In fact, it can be the bravest decision that you’ve ever made. Do not be afraid to open up to your loved ones. Let them know that you’re struggling and tell them how they can help you. Meet up with them when you’re feeling lonely. Phone them when you’re battling a particularly strong urge to purge. Something as simple as a friendly chat can go a long way towards helping you manage your disordered eating. Sometimes you need a little extra support. You may be interested in working directly with a HealED coach. Our coaches are ready to guide you through all the challenges and obstacles that you may face on your road to stopping purging. Go back to step one and forgive yourself. It’s the best thing that you can do if you encounter a bump in the road. Being angry at yourself won’t do you any good, nor will dwelling on the feeling of disappointment. At the end of the day, you’re embarking on a life-changing journey – and journeys like this one aren’t meant to be easy. Even if you end up purging at some point during your recovery, it doesn’t mean that you’re back at square one. If I relapsed on day 50, I would count the next day as day 51 instead of going right back to the start. The road to recovery is never linear. As long as you just stay on it, you’re on the right path. Release the anxiety about tomorrow. Recovery is always happening in the present and this is where your attention should be focused. Download your free ‘Stop Purging’ audio here. If you need extra support to stop purging you can always work with one of our qualified recovery coaches here. I truly do believe in you. I am certain that you can recover. Yet, my belief, however firm, can only go so far. What is really capable of turning your life around is your belief in yourself. This is the thing that you should always hold on to. This is the thing that you should fight tooth and nail to regain if you happen to lose it along the way. This is the thing that can ultimately help you stop purging for good. You deserve to stop purging. And I do hope that, with the help of this guide and your growing self-belief, you’ll be able to walk the whole road towards real and lasting recovery. Spread the word. Email it to someone, post it on Facebook, send a tweet. Help others get better and to get free. Amazing article full of wonderful tips and ideas. Thanks Ali! Thank you so much! A very close relative of mine is doing this and when I confront him, he gets so defensive and tell me to leave him alone! It hurts my heart that he is doing this to himself! He is such an amazing and strong person that I find it so difficult to understand how he cannot get rid of this habit! He already hurt his liver and oesuphilus! I dont know how to reach inside of him! This has been going on for more than 5 years that I know of! I just want him to help himself! I will save and re-read your email as often as possible to be able to live a bulimia free life. Once again, thanks you so much for the effort u put into helping other people with the same struggle to be able to actually live again. Your hard work and passion is very much appreciated. As a victim yo Bulimia for over 40 years!! !, this is perhaps the most Back to Basic Approach that Doesn’t have to overwhelm us to thinking we have failed before we even get started! I have always stated that the binge/purging was something that started out as a Diet that We Could Control….Yet it Will Completely Control Us!!!!! I’m looking forward to starting this Healing process Once Again, as we can never give up!!! May THIS be the Beginning to the Best Life Ever!!!! Im not bullimic and I don’t know if not dieting is the best solution for me so I guess that your program isn’t the best for me. Im a binge eater and so many of the suggestions in the book have helped me. So I ‘ve taken some of your suggestions and it was very beneficial especially the meditation also I can’t afford the coaching. So thanks for all your encouragement. Gail K.